Celtic wedding band features sterling silver construction with a continuous row of filigree Trinity knots. The filigree Trinity knot design is continuous on this sterling silver Celtic band for women. 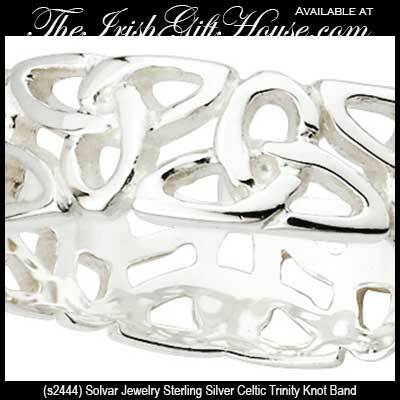 The Celtic wedding ring measures 1/4" wide and it is made by Solvar Jewelry in Dublin, Ireland. 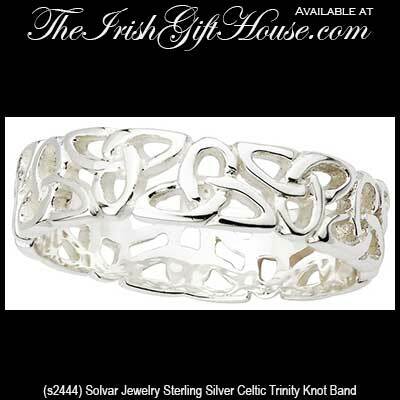 The Trinity wedding band is gift boxed with a Celtic knot history card, complements of The Irish Gift House. Sterling silver Celtic ring features a spiral and Trinity motif; it is suitable as a women's wedding band. Sterling silver Celtic wedding band features a continuous row of filigree Trinity knots.